Use the Depth Window to quickly see the counterparties on each side of the market, while still being able to view the prices of other contracts in a Market Grid. You can access the Depth Window from the Control Panel by clicking the Window tab. 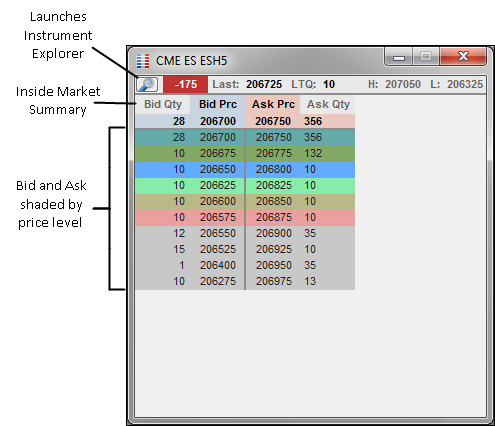 The standalone Depth Window displays either detailed or aggregated market depth for a specific contract. A floating version can also be launched from the Market Grid to display depth for the currently selected contract. Data in the Depth Window updates in real-time. Orders can be submitted using your floating order entry window by clicking on the BidQty, Bid Prc, Ask Prc, or AskQty columns in the Depth Window. A left-click opens a floating order entry window with an aggressive action, and a right-click opens a floating order entry window with a passive action. This also works in Broker Mode and when Join on left click is enabled for the floating order entry window in Global Settings. However, if Join on left click is enabled, the left-click and right-click actions are reversed. The Depth Window is available in both X_TRADER® and X_TRADER® Pro and is supported in Multibroker and non-Multibroker environments.